waiting for the bus on the way home from my new job. 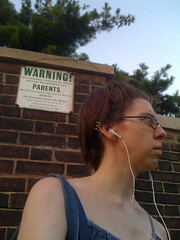 i love the sign that warns parents. i can't remember what else it says- there's a big cemetary on the other side of the wall, and it's basically the damages caused by minors their parents have to pay for.